Your business class flights to Bahrain are hassle-free when booking with Just Fly Business. We love to create and maintain long lasting relationships with you or your company through a superior standard of service. Whether you are travelling on business or for leisure, your personal travel consultant will find the best value business flights to Bahrain available. 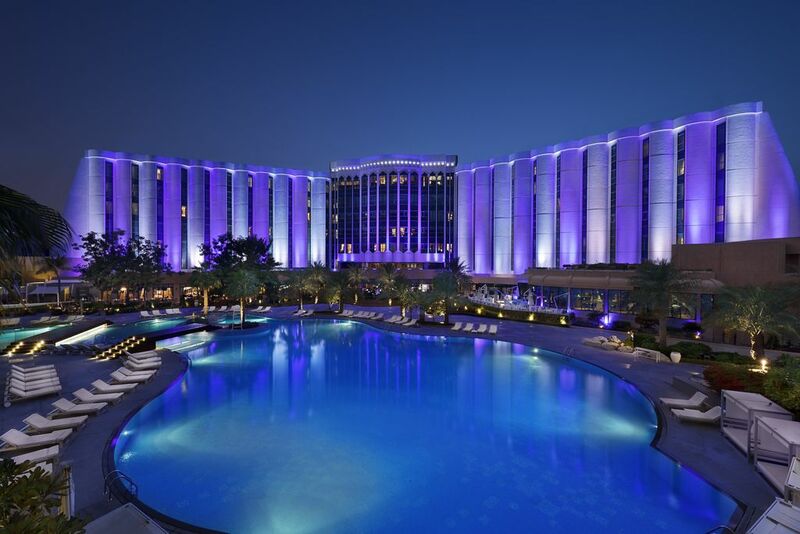 Our travel specialists can also help with fantastic accommodation recommendations, car hire, transfers, and parking, and along with the perfect business and first class flights to Bahrain, create an itinerary to suit your needs. On the foreshore in Manama and located next to the National Theatre, the Bahrain National Museum preserves the heritage and history of the Kingdom of Bahrain over 4,000 years. With several halls across 6 different sections, it holds exhibits ranging from traditional handicrafts and ancient customs, to preserved documents and manuscripts. 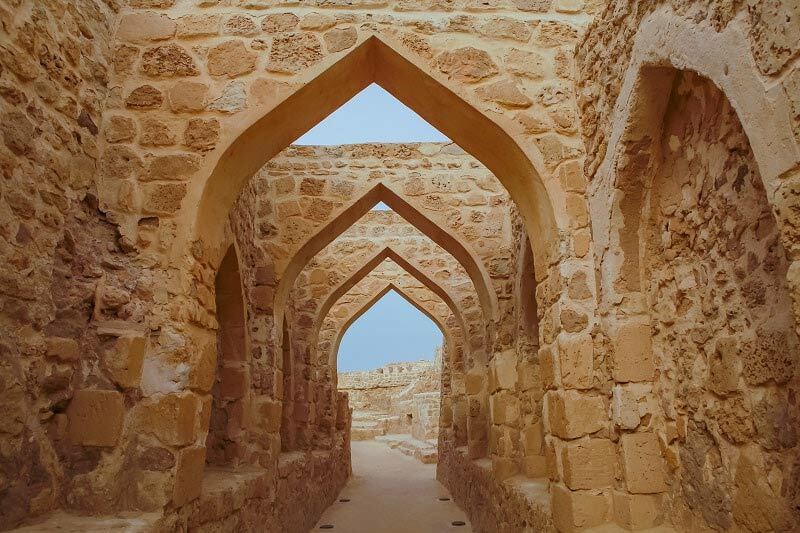 Registered as a UNESCO World Heritage Site, Qal’at al-Bahrain, more commonly known as Bahrain Fort, is one of the best examples of the rich history of this island kingdom. Excavations of the past 50 years have revealed residential, commercial, public, and military structures all within the walls of the fort that is perched atop a 17 ½ hectare man-made hill. The adjoining museum displays over 500 artefacts in 5 exhibition halls, and provides visitors with a fascinating insight into the evolution of the site since it was built in the 16th Century. An informative audio guide is also available to provide visitors with important information into this amazing piece of history. Insider’s Tip: Visit the fort in the late afternoon to watch the sun set over the ruins. As the fort is floodlit in the evening, the setting sun brings the colours of the structure out and makes for a very photogenic experience on all holidays to Bahrain. Set in one of Bahrain’s oldest buildings, the Bab al-Bahrain is a local landmark. With traditional Arabian architecture and lavish water features, visitors can get lost in its narrow passages filled with stalls. Follow the aromas of coffee, spices, and shisha, and pick up a bargain to bring home with you! Insider’s Tip: Those looking for the glitter of gold in Bahrain should venture down the road to Gold City and browse the jewellery shops with all their sparkly contents! One of the largest mosques in the world, the Al Fateh Grand Mosque in Manama can accommodate up to 7,000 worshippers under its domed roof. A working mosque and often quite busy, visit on one of the open days when a guide can show you through the building highlighting its beautiful interior. 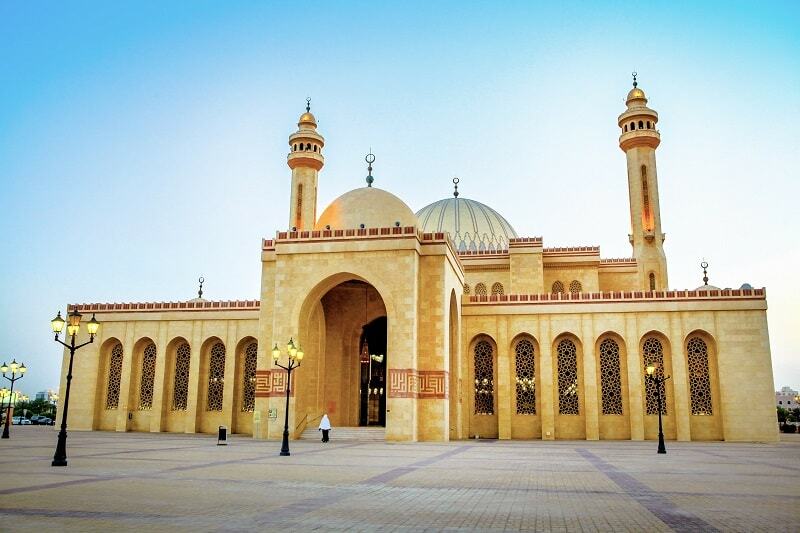 Although only a small country, Bahrain has a lot to offer people that would like to escape the city for a day. The coastline is dotted with Dilmun Era forts such as Arad Fort set across the passage on an island opposite Manama. Alternatively, head south and visit the largest prehistoric cemetery in the world, the Dilmun Burial Mounds. Thousands of mounds averaging 15 metres high and 45 metres in diameter cover large areas of the country and are the resting places of the Dilmun people that lived here over 4,000 years ago. Further south and you can see the “Tree of Life”, a single tree encompassed by the desert that has stood there for approximately 400 years. With a colourful history painted by the locals, the tree is believed to be the site for cults practicing ancient rites. Located opposite the Diplomatic District and on the shores of Bahrain Bay, the Four Seasons Hotel offers businesses a range of meeting spaces to suit your needs. With 2 boardrooms and multiple meeting spaces, The Ritz-Carlton has exemplary service and facilities to cater for your next business event. 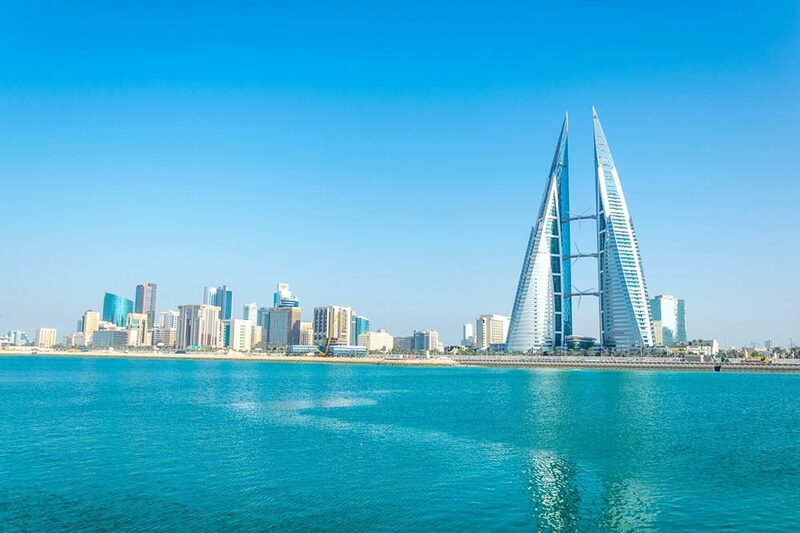 An island kingdom, flights to Bahrain are the preferred method of reaching the country as it is only joined on to the mainland of Saudi Arabia by a 15 mile collection of bridges that have you arriving into the city of Dammam. The country of Qatar is located across the water to the east with its capital Doha becoming more popular as a business centre in the region. Further afield, the United Arab Emirates has the modern metropolis of Dubai, the home of Emirates, and the slightly more traditional Abu Dhabi.